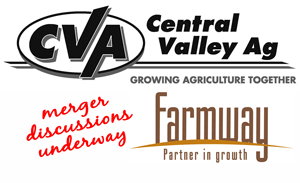 The Board of Directors for both Central Valley Ag (CVA) and Farmway Co-op, Inc. (Farmway) have each voted unanimously to begin a formal study regarding the possibility of merging the two cooperatives. This study will be considered and reviewed by both cooperatives to determine if consolidation and merger would be beneficial to the members of both cooperatives. Completion of the study is expected within 60-90 days. Further action related to a merger will be done once the study has been completed and diligently reviewed and discussed by each organization’s Board of Directors. Farmway is focused on helping their producer-owners succeed. Headquartered in Beloit, KS, Farmway has 37 locations across nine counties in North Central Kansas, offering energy, agronomy, feed and grain solutions. Find out more about Farmway by visiting www.farmwaycoop.com.